Extravagant and colourful but at the same time quite self-contained: this is how the famous Park Güell that was designed by one of the most famous architects in the world, Antoni Gaudí, comes across. A visit to this fabulous park with its thousands of mosaics is an absolute must for those who wish to see the best of what Barcelona has to offer. Considered to be one of the most popular attractions in Barcelona as well as in Spain over all, it fascinates thousands of tourists from every part of the world each year. The two porter's lodges which are reminiscent of the gingerbread houses in Hansel & Gretel, the salamander on the dragon staircase, the small house in which the architect lived and much more awaits you inside the park. 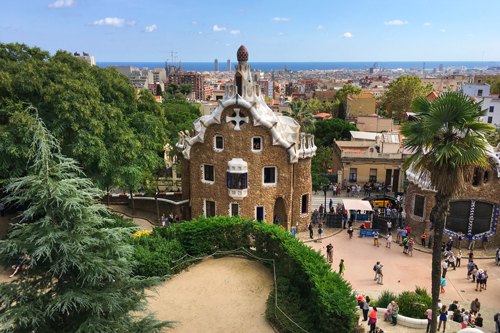 In this article you will find out about the park's history, what to expect from your visit, the best times to visit and how to get there as well as why it is important to buy entry tickets in advance for access to Park Güell. Despite the park's name and that of its architect being known worldwide, perhaps the hidden history that's behind one of the most visited tourist destinations in Spain is less well known. It all started with the rapid growth of the Catalan capital and its preparations for Barcelona's Universal Exhibition of 1888. The city was in the process of being transformed into a new and dynamic metropolis with a new artistic language and the representative language of a functional urban city for its citizens. This explained and gave even more power to the works of such a singular architect as Antoni Gaudí. The Modernist movement spread rapidly, particularly in the heart of the Eixample district of Barcelona, the area of the city which was most heavily influenced by development during this period. In fact, in this area, you can still visit other architectural works by Gaudí: the Casa Batlló and the Casa Milá. Coming back to the history of the park, these were years of great progress and already at the Universal Exhibition of 1878, the famous Catalan impresario, Eusebi Güell, literally fell in love with the artistic genius of Antoni Gaudí. Numerous works were subsequently sponsored by the impresario, including the commission to construct the magnificent Park Güell in 1900. The initial project envisaged the realisation of a kind of small city within a city dedicated solely towards wealthy families wanting to benefit from the park's clean air and the spectacular views of the sea. Gaudí, with his artistic, extravagant and eccentric talent, wanted to recreate a similar atmosphere to that of the typical English residential parks. In fact, this is where the English name of "Park" Güell came from. The architect had always been a great lover of nature and the local flora, however, he introduced new Mediterranean species which required little water and designed an irrigation system that was both functional and beautiful which would help to avoid erosion of the land and at the same time, would be able to satisfy future inhabitants of the area. In reality, the park never did turn into the small noble village that had been visualised at the planning stage but, it is worth noting that both Gaudí himself and the impresario Güell were amongst the first residents. In 1914 the work was interrupted due to bureaucratic problems and initially, the park was turned into a private garden and then subsequently into a municipal park. Inside the park there is currently a state school which is located inside the house which once belonged to the Güell family. On the other hand, in the house that once belonged to Gaudí, the Gaudí House Museum can now be found and this can be visited daily by buying an entry ticket which is separate to the one that provides entry to the park itself. Park Güell is open for visits daily from 08:00 to 18:00 hours during the winter months and until 21:00 hours during the summer months. However, it is undoubtedly best to visit the park on a sunny day which, in Barcelona, is not a rarity, so don't worry about the weather too much. A lot of tourists opt to buy their tickets on the day of their visit, in other words, at the park's ticket office. However, the queues can be really long and often there is no guarantee of entry. In fact, the park abides by very strict municipal regulations and once the maximum number of permissable visitors has been reached, it is not possible to buy any more tickets even at the ticket office. Our advice is to buy your tickets on-line, thus avoiding the long and boring queues waiting for access. In addition to this, the park is very strict about entry times so we also recommend that you endeavour to be as punctual as possible. What can we visit inside the Park? We provide a more detailed response to this question in our article "Tickets for Park Güell." In any event, entry tickets allow access to the monumental zone of the park, with the only exception being the Gaudí House Museum which requires the purchase of a separate ticket. Due to ongoing maintenance work on the irrigation system for the water in the park, there are often certain areas that are closed to visitors but when there are closures, there will be information about this on the municipal website and also at the time of booking. In addition to the monumental precinct, there is also the general area of the park where there aren't any actual works by Gaudí but, undoubtedly, the stunning views of the city from on high provide one of the most beautiful panoramas of Barcelona and our recommendation is to arrive in time to see the colours of the sunset reflected in the thousands of colours of the mosaics in the park. Park Güell has three different entrances. The main entrance is on Calle de Larrard, and then from la Carretera del Carmel or from el Paisaje de Sant Josep de la Muntanya. The only entrance with a ticket office (where you can buy your entry tickets) is at the main entrance. If you're looking for the most convenient solution and also the most scenic, you can book 1, 2 or 3 days with the Barcelona double-decker Sightseeing Bus enabling you to get off at the stop named Park Güell. It is also easy to get to the park using public transport on the metro's Green Line L3 where you will need to get off at Vallcarca or Lesseps. However, bear in mind that you will be looking at a steep climb on foot! Our advice is to book the Tourist Bus and experience the trip in the open air. Or, you may prefer to use the city bus service, (lines H6, 32, 24 and 92), which will drop you at the entry at the top where the Casa Museo Gaudí is situated. A local guide is always able to enrich the visitor's experience inside the Park Güell. We suggest you to visit this beautiful park and other works of Gaudi in the company of an expert guide, such as: the Sagrada Familia, Casa Batlló, Casa Vicens, Casa Milá, Palacio Güell and the Gaudí crypt. You will have the opportunity to have an experience that is way beyond what you would normally expect. For more information, have a look at the page: English Guide to Barcelona.